A vessel is spotted off Lincoln Island. The settlers engage in excited speculation, but Pencroft eventually identifies that the vessel is flying the black flag, meaning it is a pirate ship. W34_SC The sighting of a foreign vessel causes emotions to run high as the castaways consider the implications of its appearance. 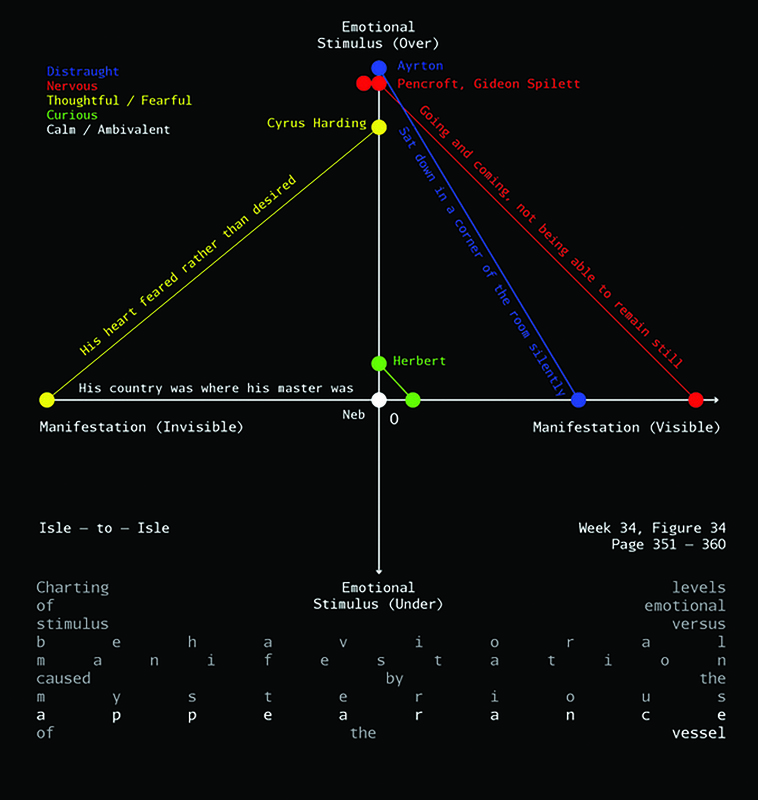 Mapping sentiment once again, I plotted each character’s feelings onto intersecting reference lines. The positions of each point were subjectively placed, merely serving as a comparative tool for distinguishing between how each character feels. The point of intersection (0,0) denotes apathy. Right of the origin on the x-axis represents behavioral and emotional manifestation, while upward of the zero point on the y-axis denotes emotional stimulus. W34_BT I took the idea of abstraction to a whole new level this week, and I’m not sure to what end. Due to the mysterious appearance of a ship, I noticed an increase in excitement, curiosity, and anxiety, and a corresponding increase in exclamation and question marks. I therefore stripped the text entirely and focused on punctuation, hoping that it would reveal certain patterns in terms of dialogue or sentence length. While I like the aesthetic, I felt that it was merely that – a visual object – and revealed little about the nature of this section. The settlers attempt to conceal any indication of their presence. However, the vessel anchors within sight of Granite House. Ayrton risks his life by swimming to the ship in order to determine the strength of her crew. He recognizes the voice of Bob Harvey, once a fellow pirate, and determines that the crew of the vessel, called the Speedy, consists of fifty escaped English convicts from Norfolk Island. Before returning, Ayrton attempts to blow up the brig. W35_SC Week 35’s diagram tracks Ayrton’s sacrificial mission to rid the island of its wicked intruders. Given the precariousness of his situation, I subdivided the story into three phases of danger – anticipation, indication and eradication. The graphic visualization also shows the progression from intention, action and presumed completion of the dangerous undertaking. 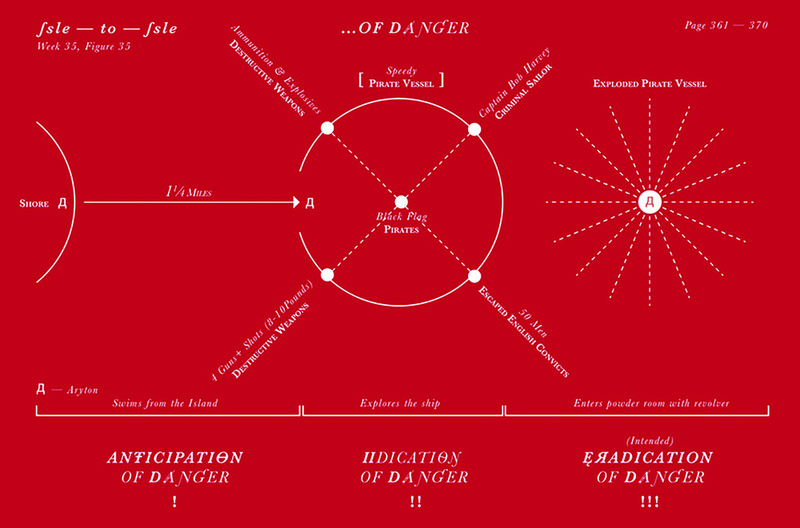 The diagram is set against a vibrant red to convey a sense of warning. W35_BT Still focusing on abstraction, perhaps in some belief that I had finally settled into a “style,” I used the visual trope of censorship/redaction. I realized that, because of the nervousness and fear in this part of the novel due to impending conflict, there were more “negative” words in these ten pages. However, without actually comparing it to previous pages, I couldn’t prove this – it was simply a feeling that I had. As I selected the words, I loosened my definition of what constituted “negativity” in order to inflate the ominousness. This was the only time that I scanned the pages, integrating the physicality of the book into my diagram. Ayrton is discovered, but manages to escape, wounded, from the ship. The settlers attempt to defend the island from the pirates; shots are fired from both sides, and the settlers wound and kill a few pirates. However, the Speedy begins to approach the island. W36_SC In Week 36, the castaways engage in a furious shootout against the pirates. Due to Verne’s extensive coverage of the carnage within the ten pages, I decided to visualize the movement of gunfire traded. A preoccupation of mine has always been how the aesthetics of a thing can be a deterrent to in-depth engagement. My diagram explores this idea by utilizing color as artifice. By rendering the diagram in a saccharine pastel color palette, I wanted the information to be comprehended (at first glance) on a purely surface level, before the viewer realizes the violent nature of the subject matter. W36_BT Another convergence between our subject matter this week allows for another comparison between our aesthetics. Both of us used circles and lines to represent the shots fired between the core characters and the invading pirates. My system focused on episodic duels, and the aesthetic emphasized flatness, bold lines, and strong colors. In contrast, Sher’s system was radial, her color palette was more muted, and her use of formal elements was subtler. The settlers fear they have to leave Granite House to be devastated by the pirates. Suddenly, they hear a deep roar, and see that the Speedy has split in two and capsized. All the pirates are dead save for six that had already landed on Lincoln Island. The settlers loot the Speedy, but are unable to identify how the explosion happened. W37_SC This week, I made a highly nonsensical diagram. The goal of the diagram was to represent the information quantitatively, but have the statistical values be completely redundant, challenging the idea of quantification as precision. I created a scoring system based off the classifications – action (seeing), intention (assumption of action) and prevention (obscuration). I pick out all the quotes in the ten pages that described the act of sight but remove them from their original sentences. The final product is an illogical string of words, with their numerical values represented by bar diagrams. I utilized ten as a limiting value to save me the trouble of attempting complex mathematics to arrive at a cumulative score. W37_BT Even though I had previously done handdrawn and “unfinished” pieces that could hardly be described as diagrams, this week still felt like an anomaly to me. When I was reading this week’s pages, I keenly felt the sense of being overwhelmed – perhaps too keenly to create a diagram out of it. I was in Singapore at the time, and found some old sheets of dry-transfer for sale at an art supply shop. I picked sets of dots rather than lettering, and transferred hundreds of them onto one corner of my sketchbook, alongside the other sketches and notes reflecting my search for the appropriate visualization. Neb finds a thick iron cylinder, and Harding deduces that the brig was exploded by a torpedo. He is convinced that all the mysterious incidents stem from one seemingly supernatural benefactor, and the settlers resolve to find him. They install the cannons from the Speedy at Granite House. Harding establishes a dam to raise the level of the lake and conceal the back entrance of their base. W38_SC A play on the symbolism of yin and yang, the diagram explores the changing states of the characters in conjunction with circumstances. Time is represented in three stages — past, present and future. The positive aspects of one’s situation and moral state are indicated in white, while the unfavorable is marked in red. The real crux of the diagram is the conflicted state of Ayrton in present time as he grapples with the desire to atone for his past misdeeds but continues to be wracked with guilt and shame. Using the contrast between light and dark as representations of the positive and negative has been a recurring theme in my diagrams. I am fascinated by the grey area between dualities as evidenced in diagrams from Weeks 14, 18, 27 and 43. I am constantly seeking new ways to represent information, and this project continues to serve as an experimental channel. W38_BT With the characters’ realization that the numerous mysterious incidents could be connected to one mysterious stranger came the characterization of this stranger as an omnipresent, omniscient being who was almost god-like in his secrecy. While I would consider this one of my more conceptually boring diagrams, I also think that it was one of the more elegant in the use of gradient – in particular, how the blue lines are more obscured on the darker blue, but more visible as the background transitions to a light grey, paralleling the spectrum of unknown/known. The settlers check on the Bonadventure, and Pencroft finds signs that the vessel has been moved in some way. Later, they realize that Ayrton has not replied their telegrams. They proceed to the corral, only to find the telegraph system destroyed. They are attacked by the six convicts and manage to kill one, but Herbert is severely wounded. W39_SC In Week 39, I used concentric squares to examine the concept of intrusion. I opted for squares as opposed to circles, as squares are a better gauge of scale. The first graphic depicts the invasion of locations (Herbert’s body is an anomaly as it is made of flesh, not geographical terrain). The second iteration identifies the invasive culprits: the convicts terrorizing the island and a bullet they fired. The third component of the diagram uses the same framework, but the labels are reversed to show how the invasion of the island, which is the biggest in scale, is less significant than the bullet piercing Herbert, who occupies the smallest mass. W39_BT This week, I felt that the characters were faced with one obstacle or conundrum after another within the span of just a few pages, each one building on the anxiety caused by the one before. I thus positioned these events and associated quotes in the form of a spiral, to suggest a loss of control. In some ways, this was also an extension of Week 37’s exploration of “being overwhelmed.” Interestingly, Sher’s use of concentric squares visually mirrored my use of the spiral. Despite being simpler in aesthetic, I felt that her diagram went deeper into the text than my own (which, in its own way, is merely a list). Ayrton has disappeared, and it is feared that he has been taken prisoner by the convicts. Spilett, Pencroft, and Harding are stranded at the corral to take care of Herbert, while Neb remains at Granite House. W40_SC I had a vision of Berny’s diagram while asleep, and was startled to find that her actual diagram was almost identical to the one in my dream. Perhaps we were so deep into this project at this point that her diagrams had begun to infiltrate my subconscious. My austere diagram illustrates the conundrum that the castaways face in trying to reunite with one another. The band of convicts roaming the island are visualized as a thorny obstacle, preventing all attempts of reconciliation. W40_BT One reason why we were able to sustain this project – besides the fact that we were accountable to each other – was that there are always new visual modes to explore. I had used the technique of collating multiple diagrammatic options in one space before, most recently in Week 37, but hadn’t created one in digital form. Unable to find one mode of representing the relationship between the characters’ “agency” and their good “fortune, I explored multiple dynamics. This methodology revisits a concept that I had explored in another artwork – a single diagram can only represent one flawed interpretation of information, and thus a fuller meaning can only be found in the interstices between multiple failed diagrams. Neb sends Jup with a message saying that the convicts invaded the plateau near Granite House. Harding, Spilett, and Pencroft have no choice but to return, bringing Herbert in a cart. They find their poultry-yard, stable, farm, and garden in ruins. Herbert loses consciousness and his condition worsens. 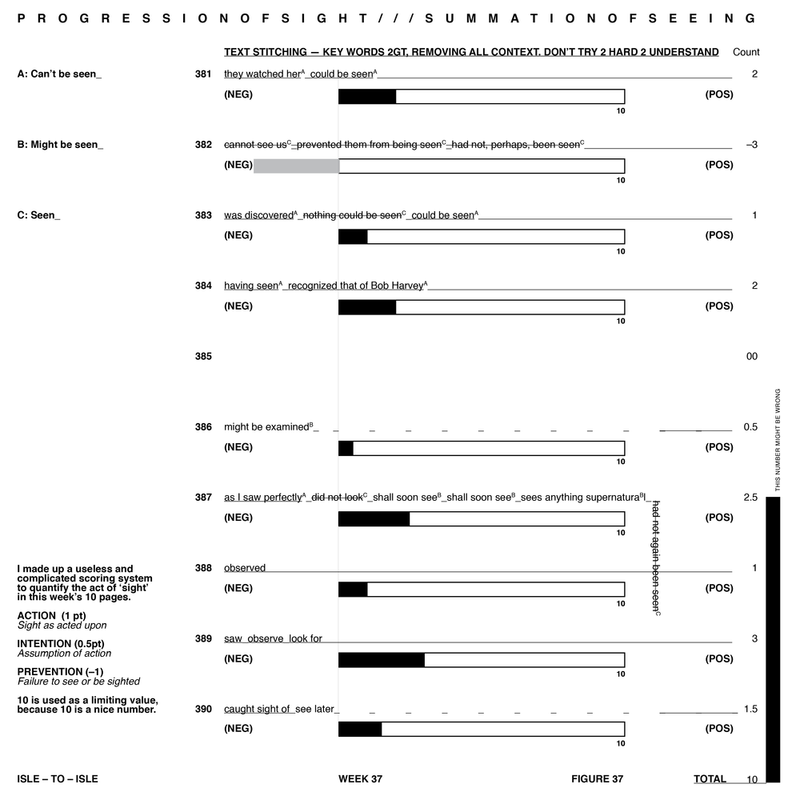 W41_SC Due to time constraints, I plugged the text from this week’s ten pages through a text analysis software called LIWC: Linguistic Inquiry and Word Count. 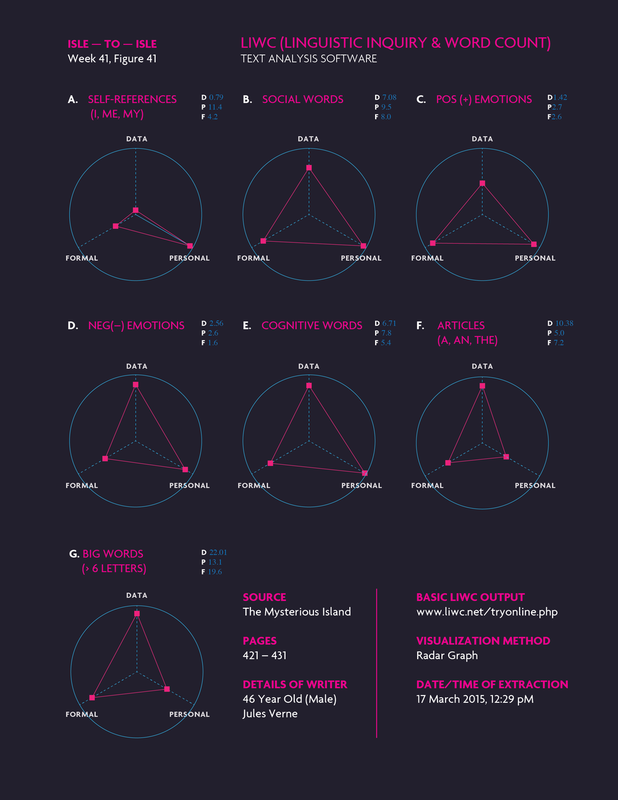 The program is able to give a measure of the nature of a text’s lexicon according to a set of metrics, such as sentiment or references to the self. Given that this was an online version for semi-occasional users, I was only privy to the basic LIWC output, hence only accessing specific dimensions. Without even performing any analysis on my part, I visualize the data using radial graphs. I question the validity of the results generated by the program, for the psychometrics of natural language is a complex issue — a word can be embedded with different meanings depending on its context and usage. This diagram received many compliments on its aesthetic quality, but not the information it contained. Given that I was representing the raw data without any cues or indications of the nature of the information, this is also a failure of information design. As a designer, I shirked the responsibility of evaluating the information for myself due to a hectic schedule, and my sloppiness thus yielded no insights into the text. W41_BT I was very disappointed in how this diagram turned out, because I felt like I had paired an elegant concept – and one of my more sophisticated systems – with a clunky design. The line thickness was a big issue for me, as I felt that thinner lines would not adequately convey the sense of entrapment, while thicker lines sapped the diagram of finesse. Sher generated her diagram electronically this week, transferring the act of reading and interpreting to an online tool. While I don’t think this one did as much to illuminate the text as her other diagrams, I loved her color palette, especially since it’s a combination that I would have never conceived. I wondered if my aesthetic senses weren’t as sharp as hers because, unlike Sher, I was not designing full-time. Herbert is struck with a malignant fever. Miraculously, the medication needed to cure him mysteriously appears just in time in Granite House, and he begins to recover. Subsequently, the settlers begin yet another expedition, hoping to find both Ayrton and their benefactor. I plotted the symptoms of Herbert’s fever onto an irregular polygonal structure, characterizing them according to observable (surface and active) and internal symptoms (hidden). The men are on the precipice of total hysterics, their weakening resolve paralleling the boy’s deteriorating state. As the underlying structure of the diagram is relational, I took liberties with modifying the shape for expressive purposes. The form is slanted at an odd angle, intended to evoke the impression of the text sliding off. W42_BT After an extensive hiatus, I revisited the medium of embroidery, this time on cloth, rather than paper. The step-by-step description of the sunlight shining on a box of life-saving medicine – that mysteriously appeared just in time to save Herbert – reminded me of a previous project, in which I had sewn lines depicting the abstracted path of light in three Vermeer paintings. At the time, I was also helping some friends with sewing for their fashion collections, so embroidery was already at the forefront of my mind. However, I was hardly meticulous with this piece; after a couple of tries, I gave up and left the letter ‘R’ in the word ‘POWDER’ overhanging the edge of the little box. The settlers return to the corral to check if the convicts have returned. They find Ayrton unconscious in his wooden house. He awakens and warns them about the convicts, who had been holding him hostage for months. Later, they discover the bodies of the five remaining convicts, who had been mysteriously killed – presumably by their benefactor. W43_SC In this week’s diagram, I explored both the literal and metaphorical implications of light and dark, using the intensity of dark and light gradients as a subjective barometer for the moral nature of events. The paradoxical convergence of light and dark happens when the castaways discover the five corpses of the convicts. The imagery here is particularly poignant, as the dead bodies are illuminated by the light of the moon. It is unsettling that, the light at the end of the tunnel (the liberation of the castaways from their enemies) is eclipsed by a dark act (mass murder of said enemies). W43_BT I struggled with this diagram very much, to the extent that I resorted to writing out all the relevant quotes and taking notes, as if I was studying for a test. Ultimately, it helped. 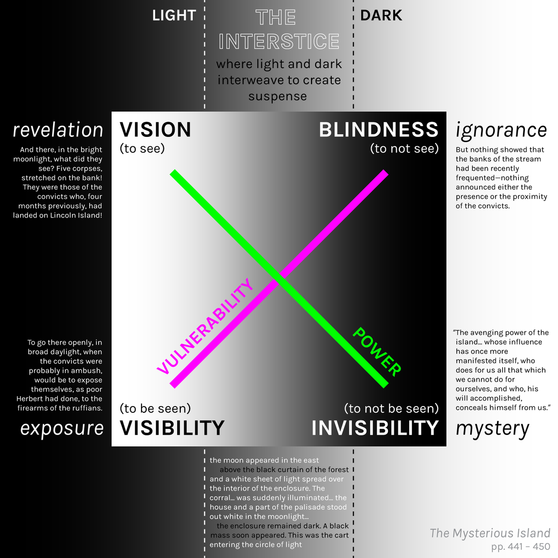 The visualization isn’t perfect – for example, the line connecting visibility and blindness is meant to suggest that the combination of both results in vulnerability, but it can also be read as an increase in vulnerability at the point of invisibility and blindness. Nonetheless, I’m still very proud of how I managed to push the concepts of light and dark beyond their traditional dichotomy. Ayrton reveals that the convicts destroyed the Bonadventure. The settlers continue searching for their benefactor, to no avail. They hear rumblings within the volcano, but see no external signs of an impending eruption. Harding draws up plans for a much larger vessel, with which they might journey to Tabor Island and beyond. The settlement is slowly rebuilt. W44_SC This diagram is a joke about how I read all the words in the ten pages but all ideas elude me. I counted every single alphabet within a specific portion of the text, which covers the castaways exploration of the island in search of the mysterious being. Paralleling the men’s failure to find their savior figure, my diagram became a metaphor for my own failings in visualizing the narrative. Therefore, I used the data in a more expressionistic way, generating a meandering line that mirrors my failed attempts at visualizing the story. W44_BT For much of the project, I was constantly thinking about how to explore new visual styles. But the fact was that I was very comfortable working with geometric shapes and color fields, because that was how my mind operated, and this week I decided to just surrender to that impulse. I would say that this diagram can be paired with the flowchart from Week 10, though I think that I managed to add a layer of sophistication to this one by endowing the direction of each branch with symbolism: escaping is a form of moving on, hence the insistent forward-moving structure; the arduous process of finding the stranger would lead to answers, hence the upward-moving labyrinth; surviving means satisfying the needs of the present, hence the downward-growing roots. After an intense winter, Harding spots vapors rising from the volcano. It continues to smoke as the settlers work on the vessel. One stormy night, they receive a telegraph telling them to come to the corral. In the house there, they find a note telling them to follow the new telegraph wire that had been connected to their existing system. W45_SC In Week 45, I returned to referencing other books; in this case, it is Between Stations by Boey Kim Cheng, a series of essays that deal with the writer’s existential feelings of displacement and yearning. This mirrors that of the castaways of the Mysterious Island who are marooned on its shores but have grown to love it. The Venn diagram maps each castaway based on where they will live upon leaving Lincoln island. Below it is a list of important factors that can influence one’s decision to leave or stay, showing the quandary that some of the castaways face as they contemplate where they will locate themselves in the future. W45_BT I had mostly avoided any kind of illustration throughout the project, but found myself exploring the motif of the volcano this week. I also took the opportunity to play around with tools and effects in Illustrator that I had hardly ever used before this point. I saw a strong correlation between the impending volcanic eruption and the building of anxiety in this section of the text. I deliberately avoided including any quotes because I wanted to allow the illustration to speak for itself, but found myself struggling to find compositional balance and fill the space as a result of the limited number of elements. The settlers realize that the wire goes into the sea, and decide to wait for low tide. They discover a cavern with a boat near the entrance. They row the boat deeper into the cavern, and find a submarine, named the Nautilus, and their benefactor within it – Captain Nemo, from Verne’s Twenty Thousand Leagues Under the Sea. Captain Nemo relates his life story. 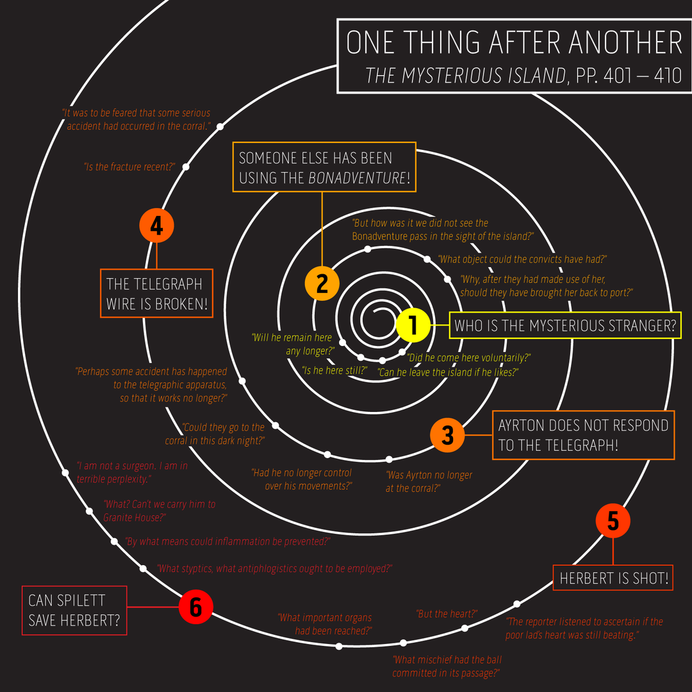 W46_SC In this diagram, I represented Captain Nemo’s reasons for wanting to disappear into the ocean for all eternity. These ideas are conveyed through a series of symmetrical arched lines. The idea of disappearing is resonant as I have always had an innate desire to vanish into thin air. The background is a photograph of the sea bed. The convergence of the curved lines lead the eye toward the ground, to create a feeling of sinking or being pulled downward. I initially felt this diagram was too rudimentary but upon further reflection, kept it purely for its personal value. To be honest, I chose my color palette this week not because it corresponded with the concept (which was more cerebral and hence felt colorless to me), but because I looked at all my other diagrams and noticed that I hadn’t really used pink. This mirrors Sher’s humorous use of the color in Week 20. The dying Captain Nemo confirms that he was indeed the cause of all the mysterious incidents. He reveals his dying wish – to be buried with the Nautilus. The settlers stay with him until he passes away, then sink the Nautilus as an act of gratitude to their benefactor. W47_SC Week 47’s diagram is about the shifting roles of the legendary submarine the Nautilus, a source of comfort for Captain Nemo, but also an engine of cruelty. I represented the information using a downward conical structure, with the tip of the cone serving as a convergence point, representing the conflicting alternatives that the ship provides. The castaways lose the opportunity to use the Nautilus as an escape vessel as it Captain Nemo desires that it be his tomb. This diagram led me to meditate on how the beauty of language and narrative emanates from the layers of meaning embedded within them. I have always been drawn to these moments of ambiguity or mixed connotations within the text, which poses difficulties in analysing complex qualitative information (as evidenced by Week 41). However, qualitative and quantitative are not mutually exclusive to me; raw information combined with the human touch is exciting and valuable. Through our interaction with nformation, there is potential to unearth new meanings and also create them. W47_BT This week, I felt very strongly that I should use embroidery in some way, because I believed that converging threads could better convey the strong “pulling” sensations that I felt from the text, as opposed to purely digital lines. The identification of Captain Nemo (from Twenty Thousand Leagues Under the Sea) as the mysterious stranger both answered questions – represented by the upward motion of enlightenment – and allowed the characters to repay their debts – represented by the downward motion of the sinking of the Nautilus with Nemo’s body within. I thought that Sher’s diagram, examining different perceptions and functions of the Nautilus throughout its existence, though still analytical, was more poetic and empathetic than most of her diagrams. The settlers continue constructing the new vessel, but the volcanic symptoms intensify, and they fear an eruption and an earthquake. W48_SC In this diagram, I represented the visible phenomena that occurs as a result of the volcano becoming active again. I used a set of graphic patterns for each manifestation and arrange them in layers from the ground up. Bordering the right side of each layer is a set of arrows indicating the spread and direction of each symptom. Unfortunately, the flat and contained aesthetic suppresses the climatic nature of the ten pages. W48_BT I was fascinated by some sketches by Ernesto Caivano that I saw at The Drawing Center in New York, in which he created a system of symbols within squares on graph paper. Using the same idea, I created simple geometrical representations of words related to the volcano, which was about to erupt, and arranged the sequence of words on each page from bottom to top, as a parallel to the imminent rising of the lava. The medium this week was a combination of watercolor and ink, recalling some watercolor studies I had done a few years ago on squared paper. Harding and Ayrton enter Dakkar Grotto, previously home to the Nautilus, and discover evidence that a volcanic eruption could destroy Lincoln Island. The settlers continue work on the vessel, but an eruption forces them to build a dam, guiding the lava into Lake Grant. 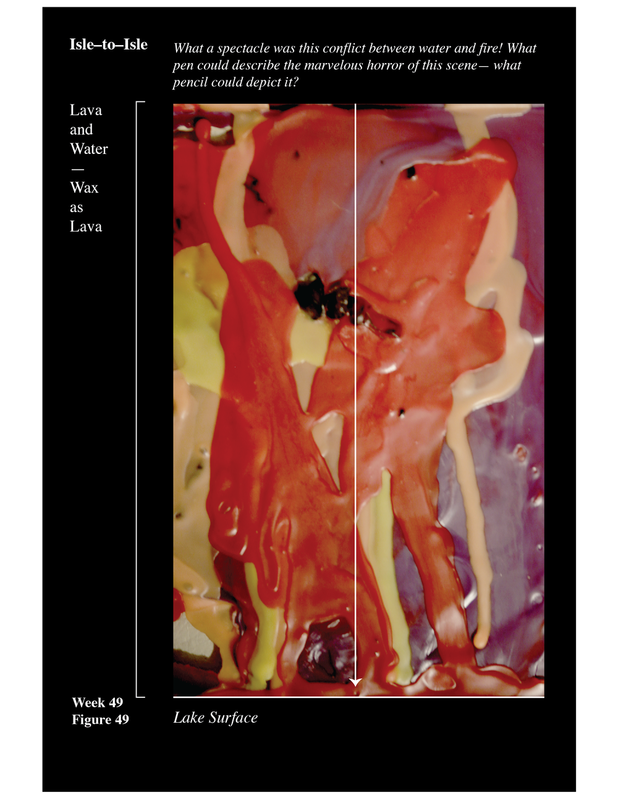 W49_SC Finding it hard to mentally visualize or comprehend the process based off the descriptions in the text, I represented the phenomena of the lava hardening into basaltic rock using melted wax, utilizing the common knowledge of liquid wax solidifying as a way to help others envision the process. However, the overly bright colors and lack of supporting text meant that this diagram was too esoteric to convey its intended message. I consider this diagram an utter failure. Berny even mistook the colored wax for ketchup and mustard. W49_BT Like Sher, I fixated on the point at which the lava and the water collide. Building on the converging lines explored in Week 47, I created a deceptively complex system of intersecting and converging blue and red lines that was actually fairly easy to construct. 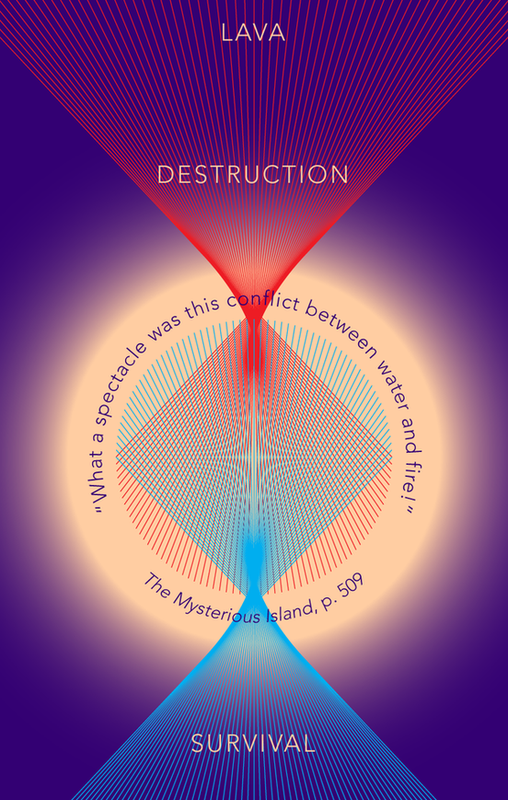 While the basic idea is simple – red lava and blue water in conflict – I couldn’t help but feel a sense of accomplishment upon devising my solution, as I felt that it illuminated the excitement of the conflict without (literally) illustrating it. Because of the visual complexity, I had initially wanted to choose a monochromatic, dull background color, but ultimately chose an electric radial gradient to emphasize the meeting point. A second eruption destroys Lincoln Island and the vessel, leaving the settlers stranded on an isolated rock. A few days later, the Duncan – the ship that left Ayrton on Tabor Island as punishment for his crimes – appears. They realize that Captain Nemo, as his final service to them, had left a message on Tabor Island, directing the ship to Lincoln Island should it ever return for Ayrton. The six men return to America on the Duncan, founding a vast colony in Iowa. W50_SC Having struggled a lot during the closing weeks of the project, I was pleasantly surprised that I did not have to strong arm myself into coming up with an idea for the very last diagram. I visualized the simple idea of the desecrated ship being replaced by a new vessel. Appropriating the form of a feedback loop, the diagram represents the binaries of loss and gain. It is also emblematic of how success and failure are two sides of the same coin. It is fitting that Berny and I both concluded the project with circular diagrams. This simple visual is a quiet but perfect ending to an exhaustive year long project. The symbol of the circle is charged with meaning. In the context of this project, it is a testament to the spirit of creation and collaboration. From the get-go, Isle-to-Isle has always followed the logic of two – a pair of individuals producing bilateral diagrams running parallel to one another. Our marriage of 50 weeks endured for as long as it did, not because of the self-imposed parameters we were obligated to fulfill, but due to the enduring kinship forged as a result of our collaborative effort. W50_BT For my final diagram, I thought it would be appropriate to focus on the final paragraph of our year-long journey to The Mysterious Island. Despite the tedium of most of the novel (or at least of this translation), Verne’s last paragraph succinctly sums up the key points of the novel in a way that suggests both continuity and a definitive beginning/end to this tale. Thus, I created a diagram to contain the entire paragraph accompanied by geometric and typographic accents, but without the linearity of a line-by-line reading. By forcing the viewer to run their eyes over the image, searching for the next number, I wanted to encourage a kind of journey-like experience of the diagram. There is something poetic about our final pairing of diagrams – mine with multiple, bold colours and more engagement with the narrative, versus Sher’s monochromatic, sparse, cerebral distillation. These are the differences that we’ve talked the most about, though they don’t surface every single week. Yet, in Week 50, we both used the basic organizing structure of a circle within a square without even consulting each other, as if somehow bound at the core. It is a fitting destination for this year-long odyssey.